Methods for the dilatometric determination of the martensite--start temperature of steels are discussed, with emphasis on noise in the experimental data. The methods are tested on a new set of experiments using a specially prepared steel. Relying on the first detection of expansion due to transformation is fraught with difficulties. Instead, an offset method is proposed which should enable independent investigators to reach the same conclusions given identical data. The technique at the same time preserves the notion that the early stages of martensite formation correspond to the start temperature. The uncertainty in the start--temperature deduced using this method is about ±12°C, better than the reported values of noise in published data. 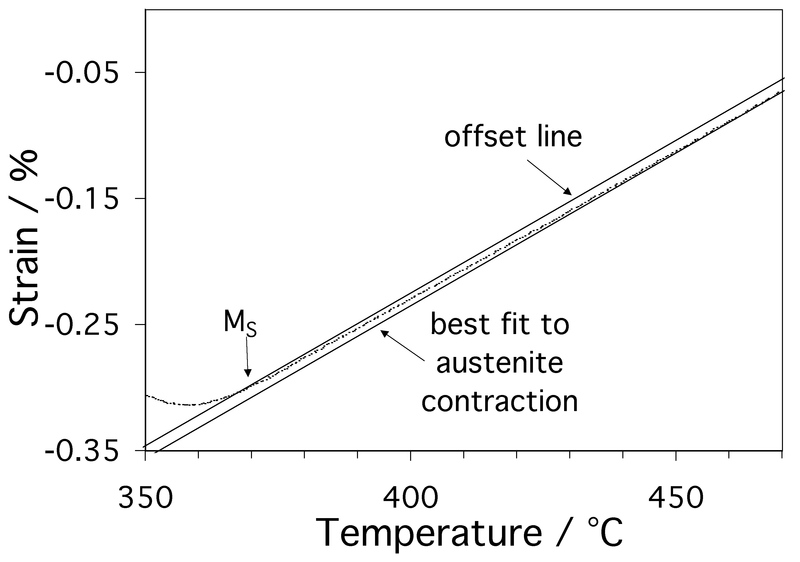 The work underlines the need to state the sensitivity of the analysis technique when quoting transformation temperatures. Materials Science and Technology 23 (2007) 556-560. Spreadsheet 1 for offset calculation. Spreadsheet 2 for offset calculation. Zip archive of experimental data (20 Mb). Short (2 min) audio interview, explaining the contents of the paper.